A good Autograph Letter Signed, to R.Patterson of the Press Office, Strand, thanking him for his ‘most able & judicious Review’ of Alison’s Life of Castlereagh in Blackwood’s Magazine, deploring the illnatured criticisms in other quarters, referring to some additional letters by Castlereagh to the Emperor Alexander about Poland, sent to Alison by the Duke of Wellington, which will be incorporated in a second edition. 4 pp. 6 x 4 inches, in good condition. Glasgow, 28 February 1862. Sir Archibald Alison (1792-1867), historian, author of the History of Europe. His Life of Castlereagh caused much hostility because Alison refused to ‘worship the Dagon of Liberalism’. 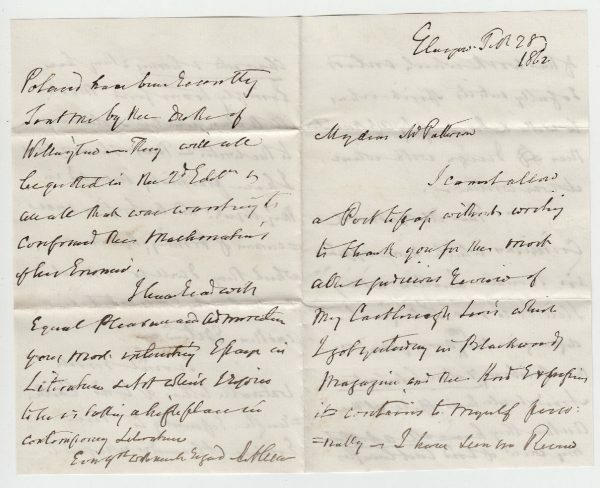 In this letter Alison explains the actions of his critics: ‘they have simply transferred Man’s ill Nature from the Statesman to the writer’.